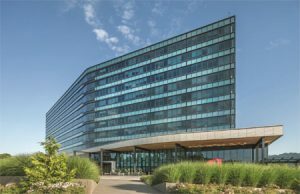 Daimler Trucks North America (DTNA) corporate headquarters in Portland, Orgeon, used energy-efficient glass to get Leadership in Energy and Environmental Design (LEED) Platinum certification. Daimler Trucks North America (DTNA) corporate headquarters, in Portland, Oregon, received Leadership in Energy and Environmental Design (LEED) Platinum certification. The 24,898-m2 (268,000-sf), nine-story building was recognized for its environmental attributes using performance-tinted glass to increase energy efficiency. Energy Star also scored the building 99 out of 100 points. Glass was integral to the design strategy executed by Ankrom Moisan Architects (AMA), which used the demands of the building’s interior workplaces to guide its overall structure. In addition to situating solid walls perpendicular to the glazing—and placing closed rooms in the center of the floor plate to optimize views and sunlight—the core of the structure was offset to maximize space for more workstations along the river-facing windows. Glass was used carefully to balance the building’s ambitious performance and design criteria. Combined in a standard 25 mm (1-in.) insulating glass unit (IGU), the glasses deliver visible light transmittance (VLT) of 26 percent and a solar heat gain coefficient (SHGC) of 0.19. Spandrels are finished in two glass coatings. an employee transportation program provides subsidized access to public transportation, increased car-charging stations, and access to electric ‘Smart’ cars.